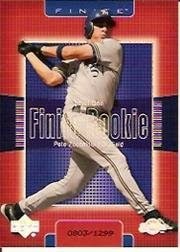 Outfielder Pete Zoccolillo played in the Cubs, Brewers, Rangers and Cardinals organizations for seven seasons, making the major leagues for 20 games with Milwaukee in 2003. Now the owner of the Morris County Cubs in Northern New Jersey, he kindly answered my questions about baseball cards. The one story I have about one of my cards was 2 years ago when my son turned 6. He had been asking me for his first pack of baseball cards and he insisted that he was going to get my card in the pack. Knowing that was impossible I told him that there is always a chance. So when we got home I had my wife distract him for a second as I carefully opened the pack. I then slid in one of my cards and resealed it to look new. He opened the pack and started to recognize some of the Yankee players and then got halfway through and almost fell off his chair when he saw my card in the pack. It was not how I always imagined it would happen when i was younger but a good story none the less. -Do you have a favorite card of yourself or of another player? I have a signed card from Adam Wainwright who was my roommate. Every night after our games we would go home and play Jeopardy and Rocky on XBOX. He would never win and claimed I only beat him because of my knowledge of Broadway musicals and movies. He signed a card that said "To Zoc, the second best Jeopardy and Rocky player I know". -Do you collect baseball cards? I have all my cards from when I was a kid and have passed them on to my son.